If you want to talk to a professional in your town about your opossum problem, click the below link for my hand-picked (over ten years) directory of wildlife control professionals, who I recommend. They will be able to discuss options and give you a price quote over the phone. It’s a simple process – you find a wild animal on your property, you trap it and then you release it, right? Well actually, that’s not really how it goes, and this is where many people the whole wildlife situation rather complicated and more than a little difficult. The thing that you should know is that there are rules and regulations set to ensure that people aren’t just randomly killing animals that shouldn’t killed or releasing animals into the wild that shouldn’t be released. Take the case of the opossum. Let’s imagine that you live in Washington – did you know that you are legally allowed to use certain traps, but some others need a permit in order for you to use them? Also, when it comes to releasing the little critters, you must only do so in certain places. Of course, the rules and regulations on animals and trapping/releasing is different from city to city, and state to state, so to be on the safe side, it is best to arm yourself with as much information and knowledge as you possibly can. This might mean giving the local wildlife control professionals a call, or getting in touch with the local animal services. You can find a lot of information online as well, but if you are going to use this, make sure that it is a reliable and reputable source, and you are clear on the facts. The last thing that you are going to want is to get into trouble for trying to remove the pesky opossum! What pest control company handles opossums? Do you have a problem opossum in your home or yard? If you do, you may already have done some research into the kind of damage this rather irritating little creature can leave in its wake, giving you only one thing to do – call a professional to get the problem sorted! 1. If you are looking online, look for reviews left by other people. You may even find testimonials on the websites of the particular companies that you are looking at. 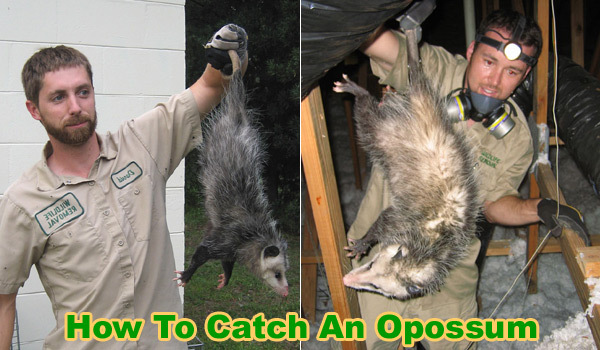 The opossum is a specific creature that will need rather specific trapping methods. For example, poisoning isn’t usually a great idea, simply because it is inhumane and you never really know where the animal will lay its head to die. 2. Ask about the services that the companies offer. Will they do the cleanup job to remove diseased urine and feces? Will they help you to block up entrances and exits that the opossum, as well as other wild animals may be using to gain access to your home? 3. Look around for prices – some companies will charge more than others, and this does not always guarantee a better service. Be smart!